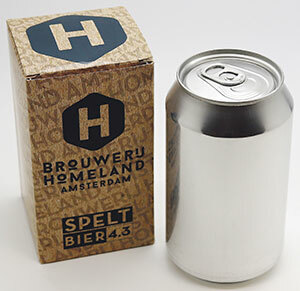 Dutch craft beer brand Brouwerij Homeland Amsterdam has collaborated with Ball Corporation to create a unique, blank can design for its popular spelt beer. The cans utilise Ball’s 33 centilitre standard format, which is a popular choice among many craft brewers. Unlike other brands, Brouwerij Homeland Amsterdam has chosen to leave the 360 degree can canvas blank, creating a strong, stand out design. The minimalist cans feature no printing or messaging, other than the name, date and alcohol percentage on the bottom of the can. This type of innovative and design-led packaging is important within the craft beer industry, as the beers are primarily brewed for taste rather than volume and result in unique products that deserve equally unique designs. Craft beer is a booming industry as consumers are increasingly demanding more authenticity, choice, and flavour options. What’s more, cans are also becoming increasingly popular for brewers, as they provide easier recycling opportunities than glass and are easier & cheaper to ship due to their light weight. The cans are now available in supermarkets, bars, restaurants, and hotels in The Netherlands. This entry was posted in News and tagged Brewing. Bookmark the permalink.